2019 climbing permits are available on Recreation.gov. 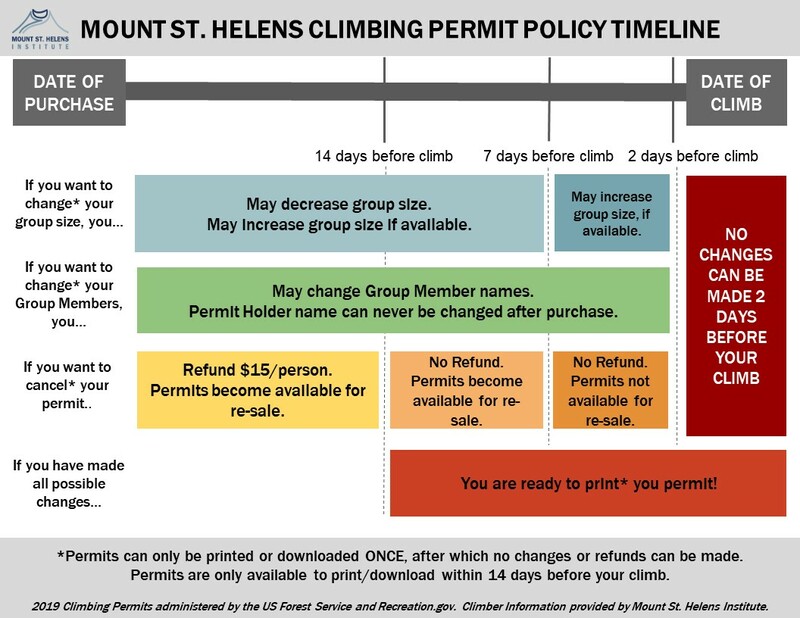 In 2019, permits will not be administered by the Mount St. Helens Institute, though MSHI will continue to provide climber information. Permits will be administered by the US Forest Service and Recreation.gov. Search for "Mount St. Helens Climbing Permits". 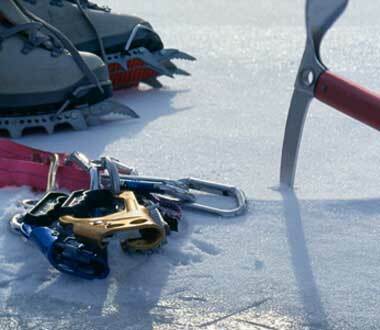 Permits are required for all climbers year-round, but between April 1 and October 31 the number of climbers is subject to a quota to protect natural resources. During the quota season, permits must be purchased online in advance. Although most aspects of the climbing program will remain the same, there are a few changes this year. The new system offers increased flexibility for climbers. Permit Holders will be able to change the members of the climbing Group, as well as cancel or refund climbing permits up to 14 days before their climb. Climbers will also be able to show a digitally downloaded version of their permit in lieu of a paper copy. Every year millions of visitors use Recreation.gov to plan, reserve, and share their experiences in national forests, national parks, and other public federal lands. Recreation.gov hosts more than 3,000 campgrounds nationwide, including 18 on the Gifford Pinchot National Forest. Did you attempt to or successfully purchase climbing permits for the 2019 season? We'd love to hear your feedback on the purchasing system. Climbing permits cost $15 per person per day. A $6 reservation fee is charged per transaction. Permits will now be one per Group, rather than one per individual. The Permit Holder (the purchaser) of the climbing permit can make a reservation for up to 12 total climbing Group Members. The Permit Holder must be included in the climbing group. The Permit Holder must provide the names of all Group Members at the time of purchase. While climbing Group Members' names can be adjusted after the purchase, the Permit Holder name cannot be changed nor refunded without cancelling the entire permit. All climbers in the Group must carry a government-issued photo ID that matches their name on the list of members on the purchased permit. April 1 - May 14: 500 climbers/day. Must be purchased online in advance. May 15 - October 31: 100 climbers/day. Must be purchased online in advance. November 1 - March 31: Unlimited climbers. Permit is free and self-issue at the trailhead. At 8,328 feet high (as measured by USGS in 2009), Mount St. Helens offers climbers a breathtaking view from the crater rim. Although it is not a technical climb, it is strenuous and hazardous due to ice, large boulders, loose pumice, fast-changing weather and volcanism. Climbers should be in very good physical condition, well equipped, informed about volcanic hazards, and have plenty of water and food. 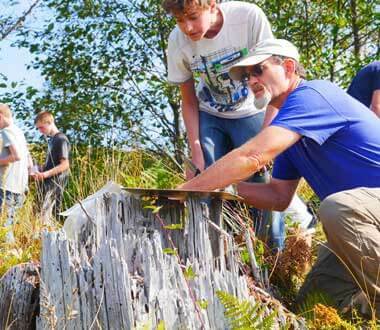 The Mount St. Helens Institute has partnered with the Mount St. Helens National Volcanic Monument to help protect the volcano’s fragile features and to ensure climbers have a safe, low-impact experience on the volcano. 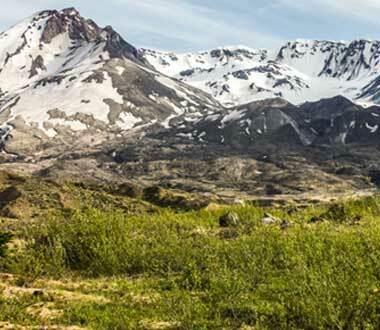 Before climbing Mount St. Helens, please read climbing rules, road and trail conditions, and other important information from the Mount St. Helens National Volcanic Monument. Guided Summit Climbs, Glacier Overlook Hikes and trips Into the Crater!